Would you like to represent QIPCO British Champions Series at the races and help new or occasional racegoers learn more about the sport? Would you like to earn free admission to the nation’s most prestigious racedays in exchange for you sharing your passion and enthusiasm for horse racing? If so, then joining the RaceMaker team might be for you! We're seeking racing fans to share their enthusiasm for, and knowledge of, the sport of horse racing and QIPCO British Champions Series. In exchange for your efforts on behalf of QIPCO British Champions Series, you can earn free admission to some of the most prestigious race meetings across the country. 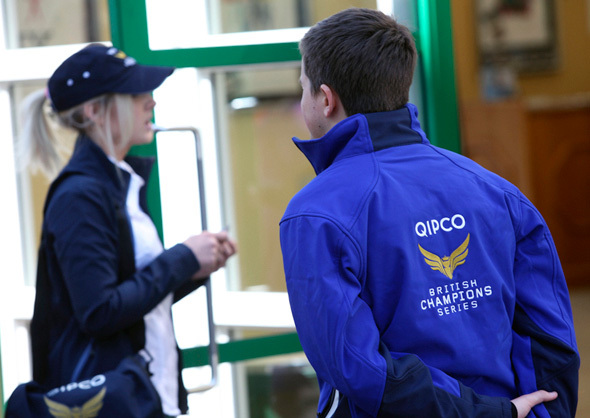 You’ll also receive a free RaceMaker’s QIPCO British Champions Series jacket, shirt and baseball cap to keep. We are assuming that, as a volunteer, a helpful, cheery and polite nature will come as standard! If it doesn’t, then volunteering probably isn’t for you. Beyond that, we want you to be yourself. Racing’s audience is varied and colourful, so our RaceMakers should reflect that. How you share your knowledge and how you interact with racegoers is up to you, although you’ll be well briefed before gates open on any raceday to make sure you’re up to speed on all that’s happening on the racecourse that day and to make sure you know where everything is. In terms of your general approach to racegoers, it’s worth remembering that you’re the expert and they’re the novice, so it’s important to make the information you impart accessible and easy to understand. Give yourself time to answer general and varied questions. It’s important to note that customers don’t need to enjoy racing on your terms, but on their terms – so there is no expectation that we’re converting newcomers into an army of experts! We want novice racegoers to have fun. Our aim is to teach people more about racing, with the objective of making their overall experience as enjoyable as possible. We believe that once we’ve got them curious, they’re off! Lastly, it should be acknowledged by all RaceMakers that they are there first and foremost to pass on their knowledge and passion to racegoers, so a proactive attitude is a must-have. Getting to see some of British racing’s most exciting races free of charge, all the while representing QIPCO British Champions Series, should be seen as a privilege, and we ask for dedication to the RaceMaker role in return. The Paddock Guide – The paddock Guide will help familiarise racegoers with the racehorse, telling them what to look out for as the horses’ parade. The Paddock Guide will also explain some of the mysteries inside the racecard, the significance of racing silks and all that goes on in and around the paddock and winners’ enclosure. The Betting Guide – The Betting Guide will explain how betting works on racecourse – from the Tote to the Ring, the types of bets available and how to make them. Racegoers also will be taught about odds and some of the slang surrounding them. The Betting Guide will also share some insights into the form, explaining what to look for in a racecard and how to make a quick assessment of a horse chances. The Racecourse Guide – The Racecourse Guide will provide help to racegoers who are not familiar with the racecourse and need to find their way around. If you know one or two racecourses particularly well, let us know! ‘Local knowledge’ will also be beneficial for this role. It’s great when the Racecourse Guide can share some of the course’s history with racegoers. How Will RaceMakers Work On The Day? You’ll need to be on course in good time, usually around an hour before gates open to the public. We’ll meet at an arranged location to distribute all necessary material and make sure everyone in the team has met one another. We’ll then give you a tour of the racecourse and brief you on the day’s activities, both on and off the track. When gates open we will ensure you are well spread out around the course, with most of the team members near the entrances, ready to greet racegoers. Around 45 minutes before the first race, you will make your way to the area of the racecourse from where you can best conduct your role – Betting Guide, Paddock Guide or Racecourse Guide. The latter of these three roles lends itself to more extensive wandering around the racecourse. Generally speaking, we’d expect that you would remain based around these areas until after the running of the big race of the day (normally the third or fourth race). After that, you’ll be free to watch the remainder of the races. The longer you can stay to help the racegoers, the better! RaceMakers will be responsible for your own transport to and from the venue. As a member of the raceday team, you will need to attend a briefing with the RaceMakers’ manager on every occasion. All RaceMakers will be provided with a food voucher to redeem when volunteer duties are complete, or a lunch bag. All normal racecourse admission conditions will apply to RaceMakers, meaning you will have to abide by enclosure rules where applicable, including dress codes. We need your help as a RaceMaker to make the QIPCO British Champions Series even better than ever before in 2019. A final RaceMaker blog, this time on the blog Editor and former managing co-ordinator of the RaceMaker team himself, John Hanley. This is what John Hanley, mildly but not seriously mad, is like. interview would have to be postponed, he insisted that it go ahead because there was no way he was going to let me down. As a statement of fact not flattery, John is a remarkable person with an uplifting spirit; a giver not a taker, an enthusiast, open, honest and idiosyncratic. He has a level of energy surprising for a 57 year old with aggressive prostate cancer, a condition he has responded to in an extraordinarily positive way. Seven years ago John organised a walk from Windermere to Carlisle racecourse which, supported by jockeys Peter Scudamore and Neale Doughty and many others, raised £10,000 for The Prostate Cancer Charity (now Prostate Cancer UK). Amazingly, the diagnosis triggered a mental change for the better. “I feel happier, like the old me,” he says. “I’d rather be where I am now than back in those years when I’d stay under my duvet all day. “After the diagnosis I went home, got my walking kit out and started walking the 16 miles around Lake Windermere. I felt a sense of relief, almost euphoria because my depression had lifted. It was my sister who was in tears. Everyone was amazed at my reaction. “I had a total shift in focus but it was more than that. I wanted to help others and that is what I am going to dedicate myself to. I’m not being a martyr, I feel free of what was bothering me before and I can manage my fitness, my diet and other things too. “I’ve been married twice and both my ex-wives, Audrey and Sue, text me every day to check that I’m okay. That helps me sleep.” It also says something about John’s likeability and the fondness and goodwill he provokes. For John Hanley, there is a lot more living to do and for those who are lucky enough to know him, inspiration. When and how did you become interested in racing? A school friend was interested and at lunchtime we’d go to Kirkby market and put a bet on. My dad was a painter and decorator and one of his colleagues was the father of Billy Beardwood, who looked after Red Rum. He brought tips from Donald McCain. As well as Red Rum, I remember Four Pals, Pewter Spear and Simmering, who all won races in the late 1970s. Simmering was owned by Emlyn Hughes and Terry McDermott, top Liverpool players. What is your earliest memory of going racing? It was at Aintree on the Thursday of the Grand National meeting in 1981. I backed four winners – Autumn Sun won the selling hurdle at 11-1, Megans Boy won at 11-2, then Broadsword and Little Bay won as favourites. They all won but I did them in a Union Jack bet and didn’t win anything. My only win was a £5 bet on Little Bay. And the race you remember best? Kildimo when he won the Sun Alliance Novices’ Chase in 1987. In those days it was one of my favourite races. I’d followed Kildimo all season. I loved the way he travelled. Another memorable race was at Cheltenham the same year when The Thinker won the Cheltenham Gold Cup in the snow and I was there to watch it. What are your favourite jumps and Flat horses? It may be predictable but, over jumps, it has to be Desert Orchid. His spirit when winning the Gold Cup on ground he didn’t like in 1989 told us all about him – and I liked his trainer David Elsworth as a man. On the Flat, Generous. When I saw him in the 2000 Guineas won by Mystiko in 1991 I thought his run had the Derby all over it. I didn’t back though because I rarely bet in big races – the love of the sport is enough. The most breathtaking moment of all was Frankel at the half-way stage in the 2011 Guineas. It took balls of steel for Henry Cecil to tell Tom Queally to bowl along in front. People expected him to blow up but we suddenly realised that he wasn’t going to. Cheltenham by a country mile. I’ve been to a lot of meetings there and have a lot of memories. I always seem to do well there and had my own system for novice hurdles and chases. For a couple of years I was encyclopedic. Which racecourse that you haven’t been to would you most like to visit? Killarney. It’s supposed to be the loveliest course. What is appealing about going racing? It’s the escapism and getting in your own bubble. During my time in Newmarket Mick Denaro taught me how to learn things from watching horses in the pre-parade ring. I’ve been a strong advocate of it ever since and try to entice newcomers to the pre-parade ring. It’s a treasure trove of little nuggets. How did you get involved in the RaceMaker initiative? Rod Street was running the Racing Tavern Quiz and in 2014 I asked Kieren Fox if he’d get jockeys to sign a racecard which I then sent as a prize for the quiz. Rod then approached me and it went from there. I was the managing co-ordinator and the first time, at Sandown, we had black jackets with Bet365 on them. I told everyone to unzip them or people would think we were bookmakers’ representatives. In a way it was a disaster but there was a cameraderie and we then got proper uniforms with headwear appropriate to where we were going – flat caps at York, panama hats at Goodwood. When people emailed in to apply to be RaceMakers I gave them my mobile phone number because I wanted it to be friendly and to discreetly find out if they were suitable for the role. I used social media to build up a rapport and a team spirit. Managing RaceMakers at the racecourse I paired people up – announcing the pairings on Twitter – and allocated them to the paddock, the betting ring, the entrances and so on according to their skills and personalities. I wanted RaceMakers to engage with people, especially first time racegoers; to face racegoers and show that RaceMakers wanted to be approached. To incentivise them, I introduced prizes for the most engaging RaceMaker. John Reid threw himself into it and Denise Large at Channel 4 gave a behind the scenes tour. There were some cracking prizes donated. The racing industry’s always focusing on attracting young people but I think elderly racegoers should be treated better. My best memory is of a Derby Day watching Kate Austin chatting to Chelsea Pensioners and Toby Smith and Joe De Souza listening to three old chaps relate their memories having not missed a Derby for 50 years. Kate, Toby and Joe were superb. That was in a pub after a hard working week at York’s Ebor meeting. Karen Thacker, Joe De Souza, Tony Scott, Craig Luccock and myself were talking to an old chap from Scotland. He was smartly turned out and had his chest puffed out and asked how old I thought he was. I said I thought he was about 91. He went quiet then said he was 78. The more I tried to dig myself out of the hole the worse it got, with the four others laughing at me. QIPCO British Champions Series is delighted to donate £250 to Prostate Cancer UK, and £250 to Rosemere Cancer Foundation, a charity based in the north which one of the oncologists treating John is closely involved with.